The key to a fantastic mushroom pizza is cooking the mushrooms before putting them on the pizza. That's not a joke. You'll cook them down and get their best flavor. Then, you'll add it to your pie. These mushrooms are combined with roasted garlic, fontina cheese, and a sprinkle of fresh mint for a unique and utterly delicious combination. You'll never look at a mushroom pizza the same way again! A note about the cheese: for the full effect of fontina cheese, be sure to seek out real Italian fontina. If you like a milder cheese on your pizza, go ahead and use the milder versions. Arrange a cooking rack on the bottom rung of an oven. If you have a pizza stone, put it on the rack — Preheat the oven to 500F. Peel the garlic and put the cloves on a square of tin foil. Drizzle with a tablespoon of the olive oil, sprinkle on a few grindings of black pepper. Enclose in the foil and pop the packet in the oven (it doesn't need to be heated up all the way to put the garlic in) until the garlic is tender. It should take 20 to 30 minutes. While the garlic roasts, trim and chop the mushrooms. 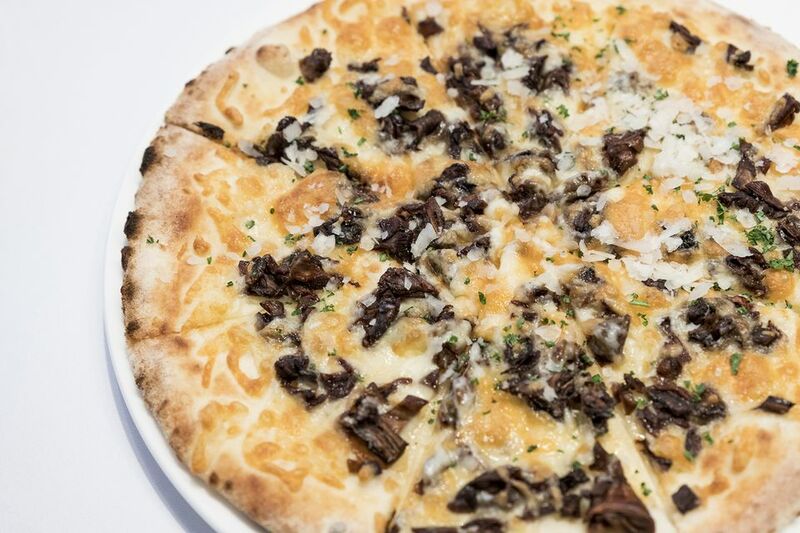 Most mushroom pizzas call for sliced mushrooms, and you can certainly do that here, too, but the chopped texture is surprisingly pleasing. Heat about 2 tablespoons of the remaining olive oil in a large frying pan over medium-high heat. When the oil is hot, add the mushrooms and the salt. Cook, frequently stirring, until the mushrooms release their liquid, the liquid cooks off, and the mushrooms start to brown. Remove from the heat and set aside. Grate the cheese and chop the mint (slice it into ribbons, if you like). When the oven's hot, stretch the dough, working with 1/2 at a time, as thin as you like. Put it on an oiled baking sheet or, if you're using a pizza stone, a floured pizza peel. Use half of the other ingredients on each pizza. Sprinkle with the fontina cheese. Scatter on the mushrooms. Arrange the garlic cloves evenly around the pizza. Sprinkle with the mint and then the Parmesan. Brush or drizzle on a bit more oil. Grate black pepper over the whole thing and bake until the cheese is melted and the crust is well browned. It should take 8 to 10 minutes. Repeat with the remaining ingredients. Homemade Pizza Dough: To make homemade pizza dough, combine 2 teaspoons dry active yeast, 1 1/2 cups warm water, 3 1/2 cups flour, 2 tablespoons olive oil, and 1 1/2 teaspoons fine sea salt in a standing mixer until all that becomes a dough. Cover and let rise until double in bulk, 60 to 90 minutes. Punch the dough down and let it rise again about 30 minutes. Divide into 2 parts, and each one will make a 12-inch thin-crust pizza.